The G303 Operator Interface Terminal combines unique capabilities normally expected from high-end units with a very affordable price. The G303 is able to communicate with many different types of hardware using high-speed RS232/422/485 communications ports and Ethernet 10 Base T/100 Base-TX communications. In addition, the G303 features USB for fast downloads of configuration files and access to trending and data logging. A CompactFlash socket is provided so that Flash cards can be used to collect your trending and data logging information as well as to store larger configuration files. In addition to accessing and controlling of external resources, the G303 allows a user to easily view and enter information. The unit uses a Liquid Crystal Display (LCD) module, which is easily readable in both indoor and outdoor applications. Users can enter data through the front panel 32-button keypad that has user identifiable keys. All G3 series HMIs include a web server, trending, data logging, and a built-in "C" language-like editor and compiler for writing your own control functions. 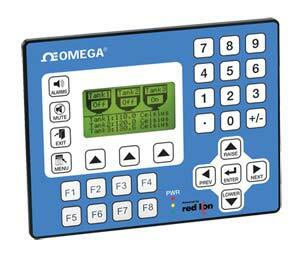 Omega offers a complete line of Web Enabled Operator Interfaces. See the Related Links section below for other models in this family. Note: Comes with panel gasket, 2 user legendable key sheets, template for panel cutout, hardware packet for mounting unit into panel, terminal block for connecting power and operator’s manual.